This is not an essential piece of kitchen equipment, but one I have recently started experimenting with. It's great for slicing fruits and vegetables into even, thin, whole slices. Once you 'get the knack' of it, it's very fast and efficient, although a little scary for a klutz like me! I've done a little research and the cheapest plastic mandolins are all around £11 or £12.....so I realise it may be a little indulgent to just go out and buy one...but I think, once you see the results, you may wish to purchase one. Argos, Lakeland and Amazon all seem to have a good selection. I'll be sharing my ideas with you shortly. 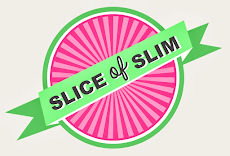 I am one happy and excited Slicer-of-Slim!